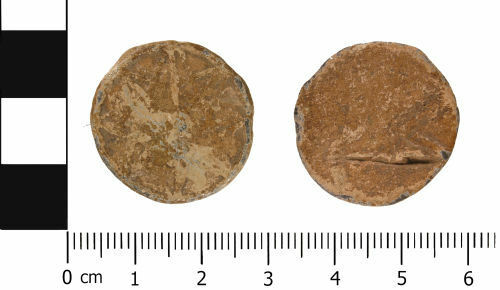 A complete lead or lead alloy unifaced token of Late Medieval to Early Post Medieval dating (AD 1400 to AD 1800). The token is circular in shape. The obverse depicts a geometric design of what appears to be a six pointed star on top of a five pointed star, made up of raised lines. This is surrounded by a raised circular ridge border (Powell Type 9). The reverse is undecorated, but has a deep, horizontal gouge (scar) at the base. The token has a diameter of 24.7 mm and is 2.7 mm thick. It weighs 9.0 g.
The token is a mid grey to light brown in colour with an even patina. Abrasion caused by movement whilst within the plough soil has resulted in the loss of some of the original surface detail. Reverse description: Plain, but with a horizontal gouge (scar) at the base.